I stumbled upon Bullet’s “White Lies, Blue Eyes” on a Rhino Super Hits Of the ’70s compilation CD about four or five years ago. I didn’t recognize the title when I scanned the disc’s track list, but I was amazed to find myself singing along the moment it began. How did I know every word to this song? 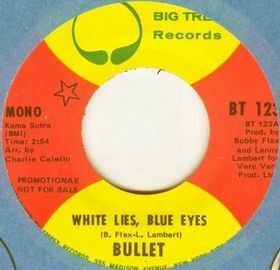 Sure, “White Lies, Blue Eyes” made it up to #26 in 1971, but I was four years old at the time and I don’t recall hearing it on the radio at any point since. Is it simply so catchy that it stayed trapped in the chasms of my mind all these years? Bullet may be the ultimate one-hit wonder– they never made an album. but “White Lies, Blue Eyes” should always be remembered as a true power-pop classic. 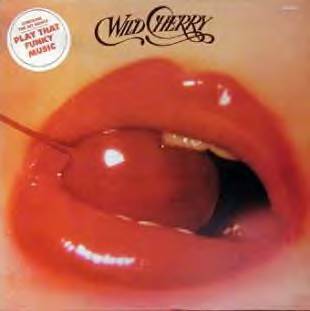 Note: This is the second appearance of Wild Cherry’s “Play That Funky Music” as a bonus track, making it the first song to be featured twice on the Analog Kid blog. Congratulations! Posted by The Analog Kid on November 11, 2013 in Pop, Power Pop, Rock and tagged "White Lies. Blue Eyes", Analog Kid, Bullet, Wild Cherry. Is it simply so catchy that it stayed trapped in the chasms of my mind all these years? Yeah, I think that’s it: “White Lies, Blue Eyes” is one hell of a power-pop song, with a chorus that worms itself into your subconscious and (apparently) stays there. Agreed my friend. We are alike you and I, we follow and find our bliss in three minute moments or power pop perfection. A catchy chorus, a tasty riff or two, a clever hook, an angelic harmony. A few moments of bliss. Thank you my friend, very much needed now. You are welcome, my friend. Glad you are enjoying the tunes. See you Saturday I hope!